Although a very enjoyable film don't be fooled into thinking this is how it all actually happened. The real Eddie the Eagle was warned by the studio that probably only about 10 to 15 percent of it is based on real events. For example, Hugh Jackman's character, Bronson Peary, the disgraced and washed up US ski jumper, is a complete fabrication. The real Eddie was mostly self taught with the help of a few short lived coaches along the way. Which makes his story even more remarkable but probably more difficult to tell in a movie that's just over two hours long. That aside, Hugh's character kind of plays the voice of reason and is the straight man (in a broken kind of way) to Eddie's enthusiastic 'madness' and determination. Once they form an alliance you're kind of hoping they both do well. Whilst Hugh plays Bronson very convincingly the real star is Taron Egerton who perfectly captures (for me at least) how I remember the real Eddie Edwards, along with Tom and Jack Costello, who both play childhood versions of Eddie. At no time in this film did I ever feel sorry for Eddie. Even when various people tell him he doesn't have what it takes. I think this is partly because I already knew he achieved his dream but at the same time, all three actors really convey Eddie's determination, even when things are against him. There's obvious comparisons here with the movie Cool Runnings, based on the Jamaican Bob Sled team (who I was surprised to learn first competed at the same Olympics). However I think Eddie's personal story is more relate-able, particularly because he chose such a dangerous sport. Though, in this interview with Eddie, that he gave to CBC at the time, you get the impression that he didn't find the actual jumps intimidating at all (no more than any of his competitors). In the interview Eddie confirms that his goal was to simply compete in an Olympics and, even though he didn't win any medals, he still held the British record for ski jumping. For me the film has one minor misstep in that Eddie's moment at the Olympic Games is momentarily pushed aside for another important moment - which I won't spoil here. I felt that event could have been better placed as it momentarily stops the entire celebratory tone (you'll know it when it happens). It's not a big misstep but it is Eddie's film and it's been building to the public embracing Eddie at Calgary from the very beginning. 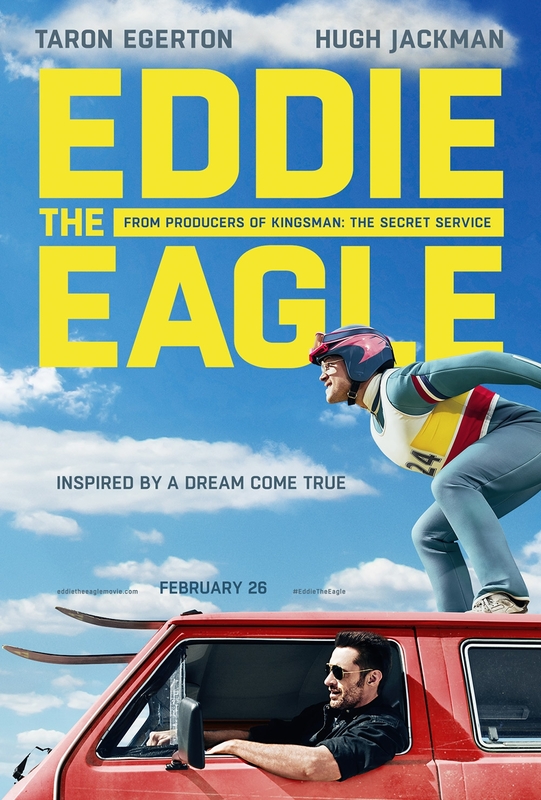 Overall Eddie the Eagle is a fun film that succeeds in capturing the spirit of what the real Eddie was hoping to achieve. Even pushing it just a little further in Eddie's wish to be taken seriously as an athlete and not just a novelty. Interestingly Eddie, in the film, is right. The 1988 Winter Olympics was his only chance to realize his dream. Although he achieved British records for ski jumping his performance was no where near as good as his nearest rivals, resulting in the qualifying bar for future Olympics being raised considerably. Although he tried to qualify for successive Olympic games after 1988 he was never good enough to make the team. This is said to be the 'Comedy Of The Year' in the TV promo I think. Did it have funny moments? I saw the trailer at the movies, and it looked good. I don't remember the real life character at all. It wouldn't be a comedy if it didn't have funny moments. Kathy and I really enjoyed it. It's both funny and inspiring even though it's not particularly accurate to Eddie's actual life story and process in getting to the Olympics. Doesn't matter if you have no interest in ski jumping. It's more about the characters than the sport. I love ski jumping actually, watching it that is, and most of the winter sports too.